One of the best parts of sock subscriptions are the different styles you get each month, allowing you to add variety to your sock drawer. Many of these services provide tips for wearing their socks. Here are a few of our favorite online guides to wearing men’s socks and ensuring your style is maximized. If you haven’t been to this site before, its a great general resource for men’s style tips, ranging from how to trim your beard to gift guides and more. They also have a page dedicated to how to wear socks appropriately. One of the best rules to wearing socks that they provide: Your socks should match your trousers. Real Men Real Style provides a modern guide to wearing the increasingly popular colorful socks. Unlike dress socks, colorful socks present their own unique challenge for the average man. 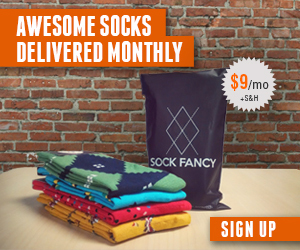 One tip they provide: be aware of the contrast levels between your shirt and socks. The Idle Man provides an in depth guide to styling your socks — ranging from the basic purpose of wearing socks (providing a cushion for your feet!) to the more nuanced sizing rules of socks. Read their full guide here. If you feel like you have your sock styles well under control, then you are in a good position to take a look at a sock subscription service such as Say it with a Sock to deliver some variety and adventure in your sock drawer!